Based on a series of light novels written by Nagaru Tanigawa and illustrated by Noizi Ito, The Melancholy of Haruhi Suzumiya follows the capricious and energetic high school girl, Haruhi Suzumiya, and her group of friends as they go on a number of surprising and unusual adventures over the school year. While 16-year-old Haruhi Suzumiya is primarily the central character in the anime, the story is told through the perceptive and often cynical eyes of Kyon, one of Haruhi’s classmates. The story begins at the start of the new school year when Kyon, having to sit in front of the mysterious Haruhi, strikes up a conversation after observing her eccentric behavior. Haruhi, claiming to have ‘no interest in ordinary humans’, only engages in conversation with Kyon after he makes a sarcastic comment about her joining every club in school only to end up quitting, unwittingly giving Haruhi, what she considers to be, a ‘brilliant’ idea. Haruhi instantly decides to starts-up her own school club, dragging Kyon into it by force, named the ‘Save our world by Overloading it with fun Suzumiya Haruhi’s Brigade,’ or the ‘S.O.S. Brigade’ for short. Soon after, Haruhi goes on an extensive school-wide search looking for ‘exciting’ club members to join the group, unwillingly dragging several other students into the brigade. First up, Haruhi recruits a female monotone bookworm by the name of Yuki Nagato, who is discovered reading in the brigade’s new clubroom. Next, she rounds up the cute, attractive and sometimes wide-eyed Mikuru Asahina, who is forced by Haruhi to dress in revealing maid and bunny outfits, quickly becoming the mascot for the brigade primarily as a way of attracting attention. Lastly, Haruhi recruits polite and well-mannered ‘mysterious transfer student’ Itsuki Koizumi, meeting Haruhi’s requirement of having a ‘mysterious’ member in the club. Coincidentally, or perhaps not, the new recruits later reveal themselves to be supernatural beings to Kyon; Yuki is an alien humanoid interface, Mikuru is a time traveler who comes from an unknown point in the future and Itsuki is an esper, working for a group known only as the ‘Organization,’ making Kyon and Haruhi the only human or typically ‘normal’ members in the brigade. Cloaked by their high school personas, the supernatural club members must secretly keep close watch on Haruhi as she unknowingly has the ability of unintentionally destroying, or reshaping, the world if ever growing bored or dissatisfied with reality. Unaware of her club members secret identities or abilities, Haruhi takes the ‘S.O.S. Brigade’ on a series of unexpected and unprecedented escapades in search for espers, aliens, time travelers or anything else exciting, mysterious or unnatural. 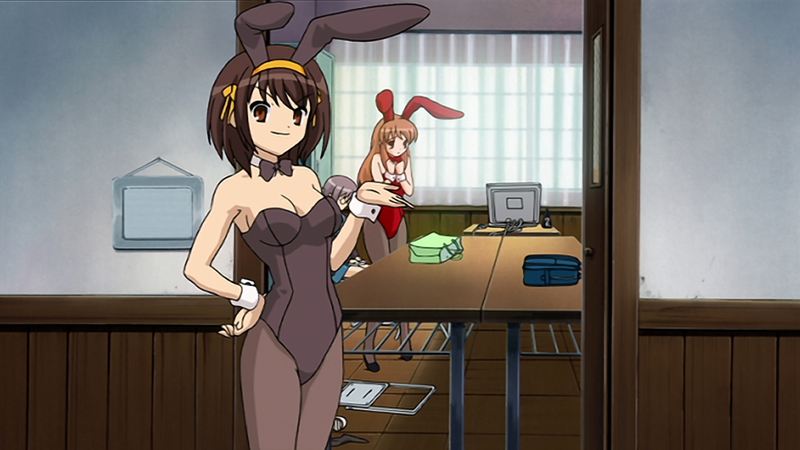 While witty, enjoyable and constantly entertaining, the anime’s real charm lies in the extravagant over-the-top behavior and persona of the self-indulgent Haruhi Suzumiya, watching this high-maintenance high schooler drag the often reluctant brigade through an assortment of ‘adventures,’ constantly forcing the group out of their comfort zones and into scenarios or situations most would normally avoid nor partake in; some highlights are a space-like video game challenge against the ‘Computer Study Group’ that is presented as an epic intergalactic space skirmish and a Baseball tournament with a zany supernatural twist. 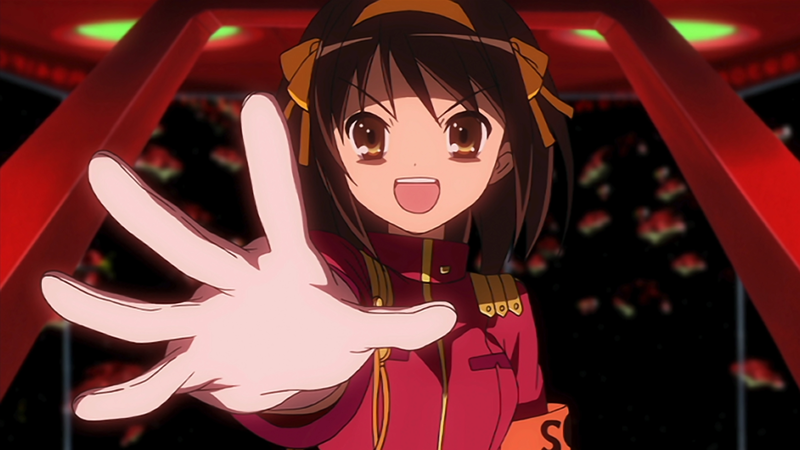 Being so multi-layered and complex, Haruhi is one of the most unique, interesting and intricate characters audiences have been subjected to, particularly in animation, as one cannot anticipate nor speculate what this girl will do, say or suggest next. 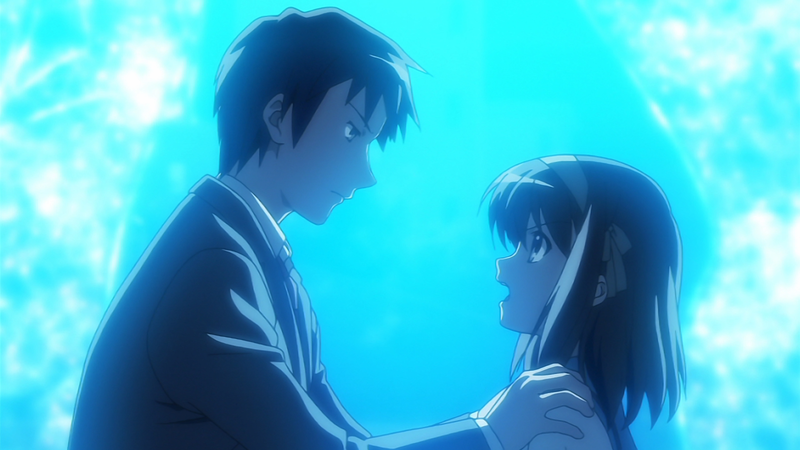 Kyon also adds a nice comical, often satirical, touch as he narrates the eccentric behaviors and doings of Haruhi, often affirming exactly what the audience is thinking. The narrative of The Melancholy of Haruhi Suzumiya sees an assortment of extraordinary scenarios taking place in the banal looking, day-to-day surrounding of Japan. The story-arcs are quite multidimensional and expansive, containing elements of numerous genres, from mystery in the Remote Island Syndrome where the brigade, trapped on a remote island, are in search of a murderer, fantasy in Mystérique Sign where several brigade members enter an alternate dimension and battle a data life-form shaped like a giant cave cricket, science fiction in the Day of Sagittarius where the ‘Computer Study Group,’ anxious to reclaim their stolen computer, challenge the ‘S.O.S. Brigade’ to a five-versus-five online match on a newly developed game, and music in Live Alive where Kyon sees Haruhi and Yuki perform live on stage with a band named ENOZ at the school Culture Fest; so there’s literally something for everyone to appreciate and enjoy. Even with elements of the fantastical and supernatural, the underlying story of The Melancholy of Haruhi Suzumiya is very basic, as at the heart of this tale is a girl, a ‘dreamer’, trying to find purpose, love and her place in the big daunting world. It’s a genuine story about ‘imagination’ and encouraging others to dream, often presenting reality with wondrous charm. Wistful and contemplative, The Melancholy of Haruhi Suzumiya certainly lives up to its name, filled with extraordinary events happening in a ‘mundane’ surrounding, this show is perfect escapism entertainment, as it transports you to a more exciting reality and introduces you to some genuinely fascinating characters. While nothing mind-blowing, this anime is still remotely original, engrossing and has a touch of authentic charm. Spending some quality time with Haruhi and the ‘S.O.S. Brigade’ is surely worth your while as it’d be difficult to find someone who doesn’t find something to enjoy in this first season.